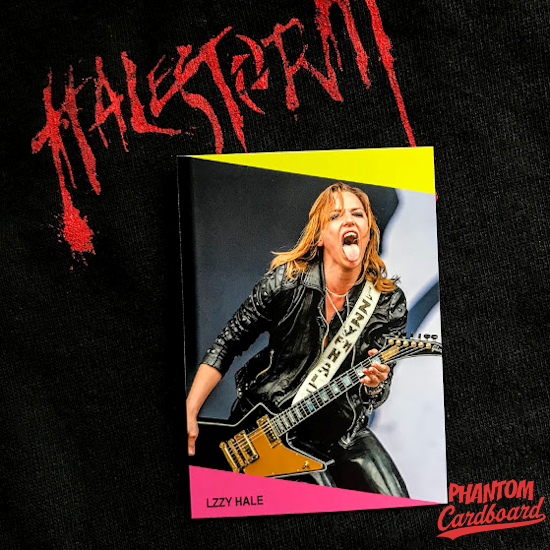 I got such a kick out of the Ultimate Warrior card I did using the 1991 SuperStars MusiCards design that I decided to revive the ProSet inspired design for another custom card, this time it's of my favorite rock star Lzzy Hale of Halestorm. I've seen Halestorm a couple of times in concert and each time I was left in awe of Lzzy's performance and stage presence. The best description I could use to describe her would be a take-no-prisoners total badass. She gives me faith that actual rock 'n' roll music is still being made and should be played loud as hell. As is with the Warrior card, the design itself is nothing all that special, but the nostalgia and instant recognizability of the Pro MusiCards that make these so cool to me. Update: This is always really cool!